Life: Where’s my Debris Shield? I haven’t posted an update in two months. I know. I know. I feel the guilt weighing heavily on me. My last post was during the STS-134 Tweetup. I never even downloaded the hundreds of iPhone pics I took of all the tweeps. Sorry guys. And here we are on the heels of our last Space Shuttle mission tweetup: STS-135 Atlantis. NEXT week!! In two days, my daughter Steph returns from her South African adventure. I’m thrilled beyond words to have her back home while she pursues her PhD. Skype is great, but face to face is much better. We’ve been busy trying to rearrange the house to make sure Steph has a place to spread out and study. Which brings me to why I have time to post this. I’m on sick leave. I experienced an unpleasant encounter with falling debris (ceramic vase) which I unsuccessfully avoided. If only I had Mission Control to monitor threatening debris and maneuver me out of the way — like they did for the crew of Space Station only this morning. Unlike me, the crew received warning in time to take cover in the Soyuz spacecraft docked to Station. The debris passed without incident, and they returned to their stations to get on with their daily schedules. I, on the other hand, experienced a direct hit. Really, you’ll never want me on a long-distance mission. I attract calamity. Yes, I’m the accident-queen. Only two weeks ago, I engaged in battle with angry ground wasps in my garden. Two days ago, I attracted a vase from the top of the refrigeration — which had held those very flowers from my garden that the wasps tried to protect. Right now, I’m awaiting word on whether or not my ankle is broken. Either way, the doctor has me off my feet with the offending leg elevated. Which, I must say, severely cramps my lifestyle. Sigh. In perspective, though, I think my calamities are God’s way to get me to slow down. I tend to live a “shot-from-a-cannon” life. I’m always in the middle of multiple projects at home, as any homeowner will understand. At work…well, we won’t even talk about that. Now that I’m forced to slow down — ok, grind to a halt — I can take a moment to reflect. The yard looks amazing. Steph boards a plane tomorrow to come home. We’re about to celebrate our last Shuttle mission — which, though sad, is still an amazing accomplishment. And the coolest thing about getting hurt: a CALL from SPACE wishing me well — thanks to Expedition 27/28 crewmember Ron Garan, Mr. Fragile Oasis! If you haven’t had a chance to browse Ron’s brainchild, Fragile Oasis, take a moment to join the community. Submit your own Earth-based project and if you get all your friends/colleagues/family to vote for it, you can get a picture from space. In the meantime, I’ll be enjoying views of Earth (my backyard) as I ice my ankle and keep it propped up on pillows. Maybe someday I’ll get my own PDS…otherwise known as Personal Debris Shield. 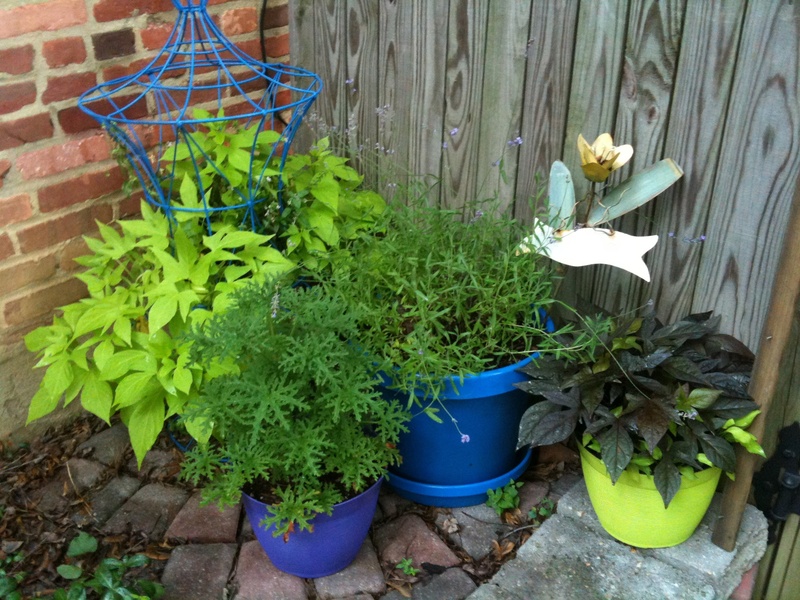 Container gardening adds color in barren corners. 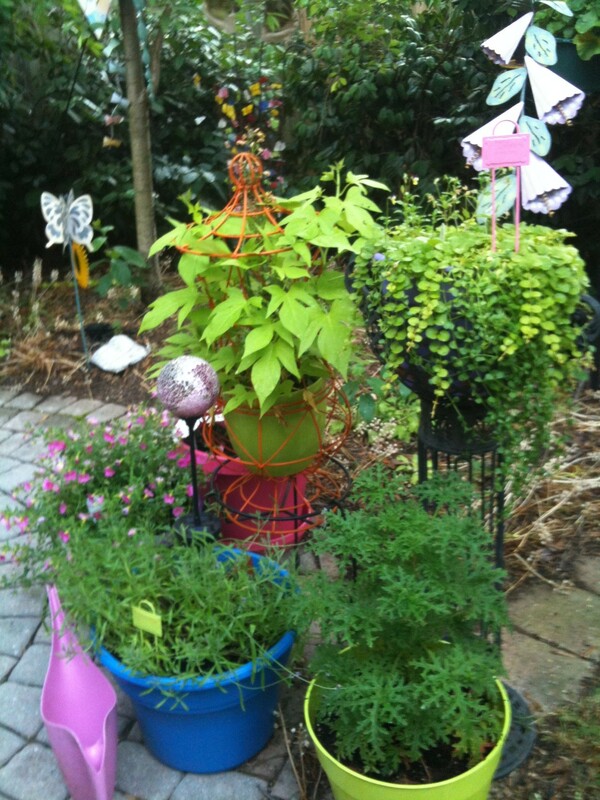 Cluster of planters in my yard. Oh my goodness Beth, sooo sorry to hear of your injury. Take it easy and rest up and enjoy Steph’s return home, you must be so very excited. Happy 4th!